How to download and install Awesomenauts? Awesomenauts is a free-to-play MOBA. You will need the Steam client in order to run the game. Download and install Steam. You can download the game from the steam page found in the download button above. Awesomenauts is 2D Multiplayer Online Battle Arena (MOBA) action game developed and published by Ronimo Games for PS3 and Xbox 360 platforms originally on 2 May 2012. The Microsoft Windows version was released shortly a while after on 1 August 2012. Releases for other versions followed in subsequent years, and on May 2017, Awesomenauts was transitioned into a free-to-play (FTP) title for the PC versions of the game. In Awesomenauts, which is set in a futuristic setting of the year 3587, players control one of the titular characters called ‘Awesomenauts’, highly trained mercenaries hired by empires for control of the galaxy, each of whom possesses individually unique aesthetics, looks, voice-overs, and mannerisms. In addition to this, each Awesomenaut has its own unique skill set, which compromises of base attributes like health and speed to special attacks. 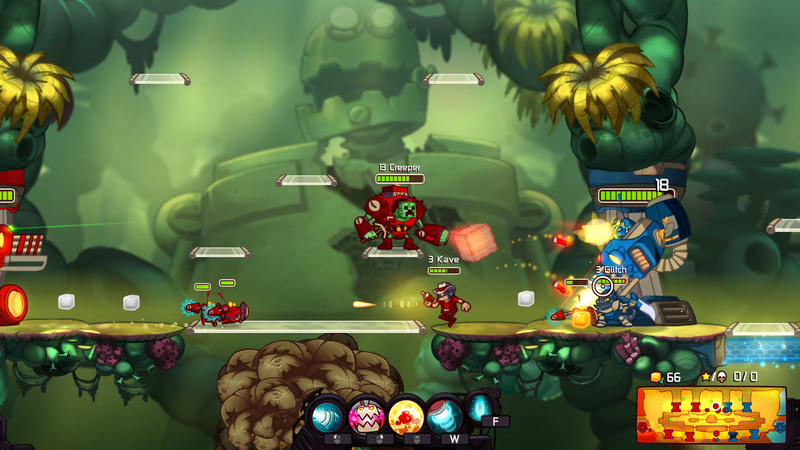 Currently there are five modes of gameplay available in Awesomenauts: The fire mode is called the Quick Match mode, and is the most commonly used one pitting two teams of players against each other; the second is called Battle mode, and in this players can have a friend play co-op with them and one other player against live players; next up is the Custom Match mode, and in this mode, players are allowed to tweak the configurations settings before playing the game, like the number of turrets available, among other; the fourth mode is called the Team Deathmatch mode, and is similar to Custom mode, wherein you can tweak the settings, although, in this mode, players have to kill a certain number of enemy Awesomenauts to win the game, instead of destroying the Solar Drill like in other modes; and the final mode is the Practice mode, where players can learn and master the basics or their skills against AI enemies. The primary and most popular game mode is the Quick Match mode in which two teams of three players battle it out against each other in maps with level designs that resemble Platformer games. The players move ahead supported by ally AI drones, and on the path, they must destroy turrets that block the path as well as enemy players and their Awesomenaut. The goal of the game is to destroy the enemy team’s Solar Collector—a holder of Solar units, which are the equivalent of currency in the Awesomenauts world. The team that destroys the Solar Collector first wins the game, and they are rewarded with Solar and experience points, which can be used to buy new weapon and ability upgrades for Awesomenauts. Gaining experience also automatically increases the player level and ranking in the global leaderboard. Awesomenauts is a creative take on the MOBA genre, and its wacky, colorful environment makes up exciting and strategic gameplay. There are updates and patches being released regularly to the game, which include new Awesomenauts and game-balancing. As a result, Awesomenauts has turned out to be a fairly popular game among MOBA fans, and it is still going strong to this day.